I’ll be without a photographer for the next month so I’ve been cooking her faves . . . just as a treat and also to have an inventory of pictures for the blog. Some of her faves are easy so I didn’t exactly use recipes for her penultimate supper—although once upon a time I did have a recipe for coconut rice. This dish entered my repertoire around five years ago when I made it for a dinner when my photographer was out of town for the weekend. It was made for an “adults only” meal because at that time, my fearless photographer mostly wanted plain rice with NOTHING IN IT! !–so I could only experiment when she was away. And then one day she fell in love with coconut rice to the point where she now gets upset if I make plain rice that might deceptively look like coconut rice. I’ve started to add the turmeric which I had seen in some recipes in order to make it clearer that white rice is plain and yellow rice is coconut rice. Soak the rice in water at least one hour before you are going to cook it. Drain and soak again at least twice or even more if you are really meticulous about getting every grain perfect. Heat the oil for one minute in a sauce pan over medium heat. Add the drained rice and cook for 2 minutes, stirring a little so that every grain gets an oil coating. Add the cardamom pods and the coconut milk and bring to boil—and then cover and cook on low heat for around 20 minutes. When there is just a drop of liquid left, remove from the stove and add the turmeric and stir. Cover with a dish towel until you are ready serve. Not much of a recipe but it’s delicious. If you want to make it super-fancy, you can add a cinnamon stick when cooking and serve with currants or pistachios tossed in and/or fried onions on top. But this is the simple weeknight version. In our house, coconut rice is served alongside all sorts of things like ground turkey with peas, but most frequently I serve it with salmon. I used to make the easiest salmon in the world but then my fearless photographer discovered the second easiest salmon in the world which is probably something that most of my readers would consider to be not particularly original. 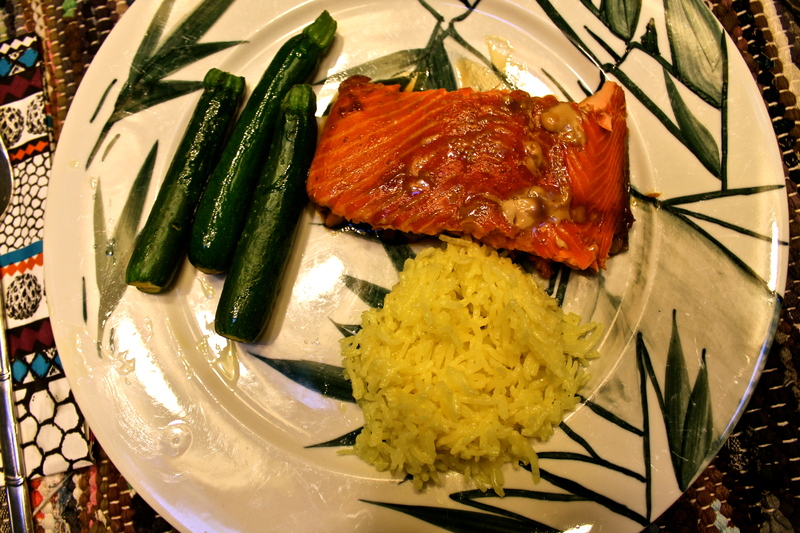 The easiest salmon in the world is when I take a salmon filet and place it in a pyrex dish sprayed with Pam, spray Pam all over it and grate fresh ginger on top and then cover it with aluminum foil and bake only until just done (15-20 minutes) so that it doesn’t get that over-cooked salmon taste. For the second easiest salmon, I mix 1/4 cup soy sauce, grated ginger (or in a pinch, powdered ginger), and 2 tablespoons brown sugar and marinate the salmon in this sauce for half an hour and then bake it around 20 minutes—again until just done and no more. These aren’t really recipes and certainly won’t shake up the food world with their originality, but they are good weeknight fare and they make my photographer so happy that she could barely stand taking pictures without digging in. I’d say these are less recipes than advice on how to make something . . . kind of like the “recipes” that the late great Nora Ephron included in Heartburn which I just reread after many years because I treated myself to The Most of Nora Ephron. Every one who knew Ephron said that in general she was full of recipes and advice on how to live well–and my advice to you is to buy this book if you haven’t already. It contains lots of tidbits that–like the easiest salmon in the world or the second easiest salmon in the world–may not be revolutionary or unusual or difficult but are delicious.